Before long, Robin and Diana were inseparable, even when he would embark on his travels to the wilds of Kenya in search of new tea stocks. Their African adventures together set the tone for the life adventure they envisioned sharing, one that soon included the addition of a child on the way. But, just as life seemed to be growing ever more enriched, Robin was suddenly struck down with polio, the crippling effects of which left him paralyzed and unable to breathe without a respirator. And, despite his youthful vigor, his prognosis was not good – perhaps several months at most, and all of it confined to a hospital bed. From the foregoing, it’s apparent the film packs quite an inspirational punch, backed by a wealth of valuable metaphysical insights. 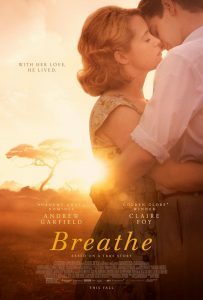 However, while “Breathe” is undeniably noble and sincere in its intents, this somewhat-overlong offering regrettably falls prey to the traps of schmaltz, manipulation and formula (at times bordering on cliché, especially in its soundtrack and cinematography). Admittedly, the film does tend to get better as it goes along (save for its drawn-out concluding segment) and features capable performances by Garfield and Foy, who clearly make this material look better than it really is. However, despite these strengths, much of the film seems rather familiar and plays more like a made-for-TV movie than a theatrical release (and one with precious little back story to boot). 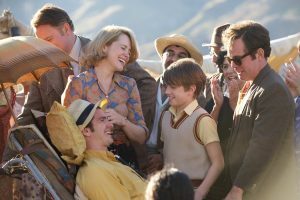 You’ll certainly come away from director Andy Serkis’s debut outing feeling inspired and uplifted, but don’t be surprised if you feel just a little cinematically unfulfilled by this one.